Martha Berry thanks Mr. Loomis for his donation. 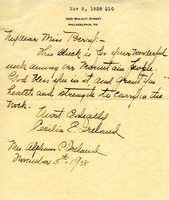 Berry tells Loomis that she does not believe that witchcraft is practiced by the mountain people of any race, or that the "ignorant superstitions" of the mountain people amount to much. 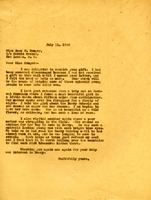 Guy Loomis encloses a scholarship and asks Berry to provide him with information about witchcraft in the Southern mountains, where there are likely "many primitive customs." 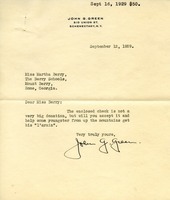 John G. Green sent Martha Berry a check, asking if she would accept it and help a young child from the up in the mountians with his learning. 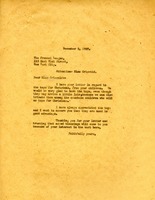 Letter thanking Miss Munger for her gift. Martha Berry explains about the Mountain Children that wish to come to school at Berry. 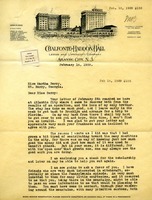 Letter to Miss Berry from Louise Lamprey requesting information . 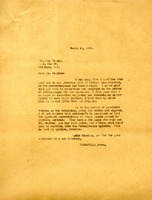 An article was enclosed asking Miss Berry to read and return regarding weaving and embroidery. 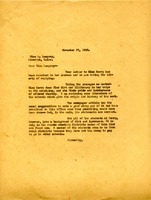 She also requested literature regarding the schools. For use with Mountain students. 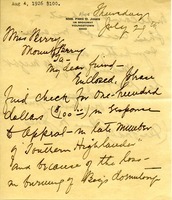 Mrs. Alice M. Jones sends $100.00 in response to the appeal made in the Southern Highlander concerning the loss of the boy's dormitory. 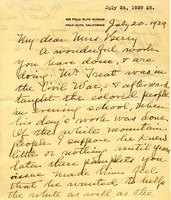 This is a letter from Mrs. Harrington to Miss Berry congratulating her on the work she is doing for the Mountaineers. Also, she is requesting information Miss Berry has in order to inform those who say "unkind" things about education in the South.